Can eating blueb erries prevent, slow down or even reverse memory loss? That is something that we are trying to figure out. Currently one in eight Americans age 65 and older suffer from Alzheimer’s disease, and there is no cure for this disease. In 2011, Dr. Cheatham and her post-doctoral fellow, Dr. Sheau Ching Chai, began a study to explore the effects of daily blueberry intake in older adults. In this study titled “Blueberries: Exciting Research Relevant to You (B.E.R.R.Y. )”, we enrolled 65-to 79-year olds with mild cognitive decline. Part 1– Completed: Over a six-month period participants were screened and then enrolled in either the intervention group or the reference group. 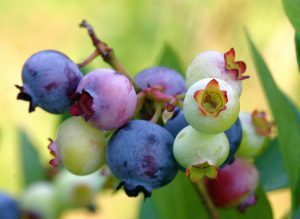 Within the intervention group participants were randomly selected to include 35g of freeze dried blueberries (equivalent to two cups of fresh blueberries) or a placebo into their normal diet each day for six months. During the six month period, all participants were brought into the lab nine times to assess their mental and physical status through a variety of tests and questionnaires. We are now in the process of analyzing the data. Part 2– Ongoing: In order to gain more information about the progression from Mild Cognitive Impairment (MCI) to dementia researchers in the lab designed a study to follow up on our B.E.R.R.Y. participants. These participants will be coming back into the lab for one visit where they will participate in some of the same assessments they completed during Part 1 of the study. Electrophysiological techniques and the CANTAB have shown promise in the diagnosis and prediction of MCI. We will compare the new data to the data collected one, two, or three years ago. In June, we began bringing our BERRY participants back in to the lab for this exciting follow-up.